The unique style of top Palekh artist Natalie Buldakova has shown in this delightful work. Most of all she likes to depict the scenes from village life and the fairy-tales. Each of her unique works looks festive and bright! 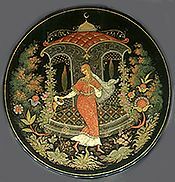 On this round box the artist depicts a scene from well-known Paushkin's fairy-tale "Ruslan and Ludmila". The structure of the composition is complex, and filled with amazing details painted in gold. Not only Ludmila and her costume is elaborately painted, much attention is also focused on the realistic reproduction of Chrenomor's Garden, richly painted flowers and gazebo on a background. The box's exterior is covered with black lacquer, while the box's interior is traditionally red. The box is constructed out of paper-mache. The lid has no hinge, and the box rests on three round legs. The work is signed with the artist's name,date, title and the village of Palekh.